TIMMINS, Ontario, Canada, February 16, 2015 (ENS) – A CN Rail freight train hauling 100 tank cars of crude oil derailed and caught fire in a remote area of northern Ontario over the weekend, the latest in a string of fiery incidents involving oil trains in Canada and the United States. A CN spokesman said the derailment took place just before midnight Saturday, about 80 kilometers south of Timmins, Ontario, in a wooded area, some 180 km northwest of the nearest city, Sudbury, Ontario. Patrick Waldron said 29 railway cars in the 100-car train derailed, and seven caught fire. He says no one was injured as a result of the incident. Waldron says CN has sent crews and equipment to the site of the incident and removed 71 cars from the derailment site on Sunday. “Working in collaboration with Transportation Safety Board officials, CN responders safely removed derailed cars from the right of way, allowing workers to get closer to the core of the derailment, where a fire is still burning,” Waldron told ENS in an email. “Those CN crews made progress overnight (Sunday into Monday) in bitter winter conditions as temperatures fell to minus 40 degrees Celsius,” Waldron explained. Senior operating officers along with the Dangerous Goods division of Transport Canada, Environment Canada and safety experts remain on the scene. CN continues to work with in close collaboration with key stakeholders, including the Transportation Safety Board and the Ontario Ministry of Environment, as crews work to extinguish the fire, remove the rail cars, repair the track, conduct a full investigation into the incident and move forward with a comprehensive environmental clean-up. Mitigation and restoration plans continue to be developed and implemented, Waldron said. The derailment blocked a main railway line, which resulted in Via Rail’s cancellation of trains operating between Winnipeg and Toronto. Via said alternate transportation would be provided to customers already en route or scheduled to board the train on Sunday. Environmental groups on both sides of the border are disturbed by the growing number of oil train derailmnents and fires. The worst was a derailment in Lac-Megantic, Quebec in July 2013 that killed 47 people, forced the evacuation of 2,000 people, and incinerated parts of this tourist destination. The Conservative Government of Stephen Harper has been under pressure to tighten its rail-safety policies since the July, 2013 oil train derailment. In January, the Transportation Safety Board issued a report saying it remains concerned about Ottawa’s oversight of Canadian railway companies, 18 months after the Lac-Mégantic crash. While the TSB recognized some progress on rail-safety issues, it said the government must do more to make certain that railways are following their own safety management systems. 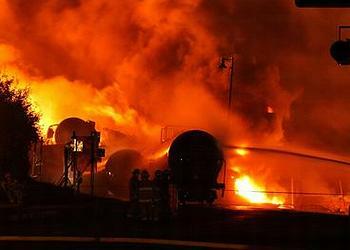 In January, a CN train whose cargo included gas and crude oil derailed in New Brunswick and burned for four days. A total of 19 cars and one locomotive on the 122-car, four-locomotive train went off the rails just a week after another fiery derailment of a crude oil train in North Dakota. In the United States, the most recent explosive derailment occurred in April of last year, in downtown Lynchburg, Virginia, resulting in crude oil leaking out of punctured tank cars, setting the James River on fire. “It’s disturbing to see yet another oil train go off the tracks with disastrous consequences,” said Mollie Matteson, a senior scientist with the nonprofit Center for Biological Diversity. “It’s clearly time to take action on the growing use of the oil trains that are putting people, wildlife and the environment at serious risk. “What happened in Ontario could happen anywhere along the thousands of miles of tracks that oil trains use every day in the United States,” Matteson said. The practice of transporting oil by rail has grown from very few trains in 2008 to more than 400,000 rail cars of oil in 2013. Billions of gallons of oil pass through towns and cities ill-equipped to respond to the kinds of explosions and spills that have been occurring. Ethanol shipments by rail have also raised safety concerns. On February 4, a train transporting ethanol derailed along the Mississippi River in Iowa, catching fire and sending an unknown amount of ethanol into the river. The oil and railroad industries have lobbied for weaker rules on tank car safety and brake requirements and more time to comply with any new rules.